A delicate strand of pearls is regarded as the safe, conservative bridal necklace tradition. However, not every bride loves tradition. 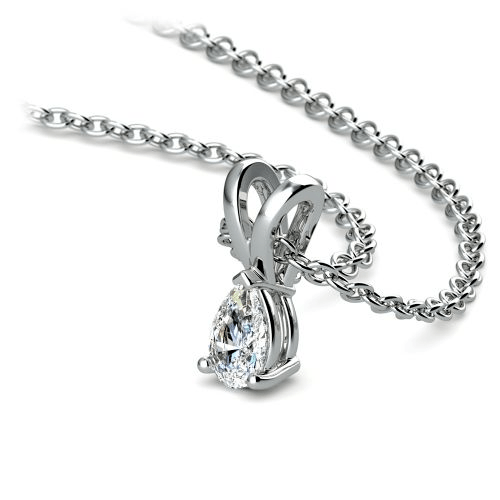 The bride that wants to make a stunning style statement on her wedding day may select a more glamorous, bolder bridal accessory—such as a pear-shaped diamond necklace. Forget subtle and conservative. Instead channel Liz Taylor, whose most iconic piece of jewelry was the legendary 68-carat Taylor Burton pear-shaped diamond. Taylor was one of Hollywood’s most stylish and chic glam goddesses. She loved her jewelry, and she knew how to wear gems with the utmost grace and elegance. Taylor knew that when worn as the central focus, pear-shaped diamonds accent the collarbone, help elongate the neck and create a stunning accessory to complement any gown. For brides who are still unsure about ditching the pearls in lieu of a pear diamond, here are a few ways to wear pear pendants for classic—or more daring—bridal beauty. How a bride wears a pear-shaped diamond necklace really depends on the dress design—or, rather, the dress neckline. To channel a delicate conservative look while wearing a dress that features a sweetheart neckline, select a demure pear-shaped necklace, not the Liz Taylor mega-rock look. 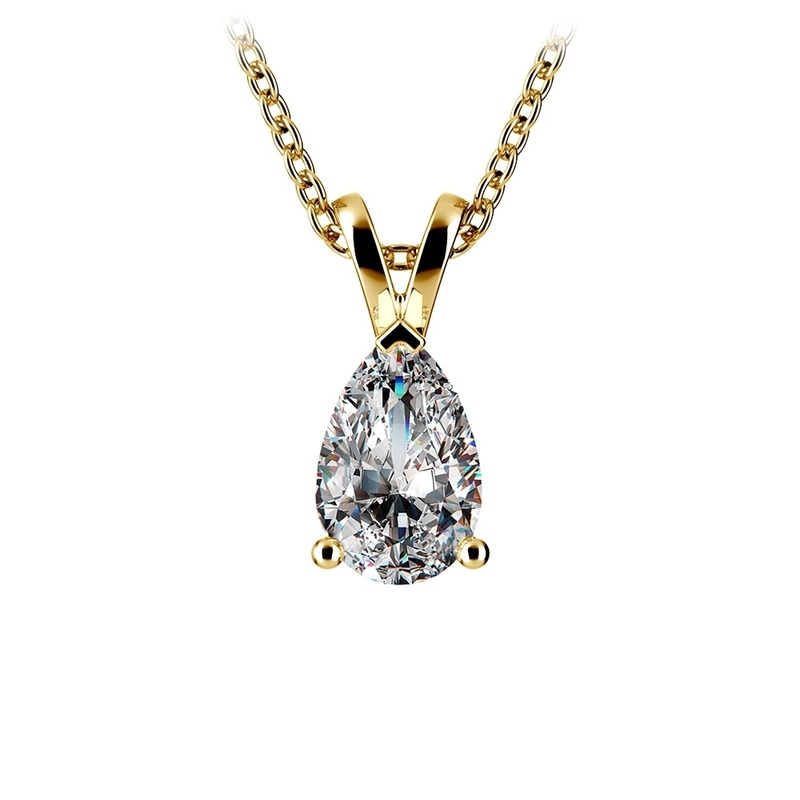 Instead, select a necklace that features a smaller pear diamond. The idea is to draw the eye to the neck, without making an ostentatious statement. Sweetheart necklines already accentuate the bust, so opting for a delicate necklace keeps the design tasteful and conservative. A pear cut in a halo setting looks great on a strapless dress. A halo increases the visual size of the diamond and creates a more dramatic effect. Still tasteful and stunning, but the design draws a bit more attention. Gowns that are designed with a bateau neckline offer more coverage around the bust. To add sparkle around the neckline, choose a pendant with a short chain so the diamond hits the base of the neck right at the throat. This is not a true choker, but very close in design. For the Hollywood glamour bride, go for bold and big. Brides who want to be noticed, who do not favor traditional or conservative appeal and who want to make a statement, should choose larger carat necklaces. When going large, remember to mind the chain length. 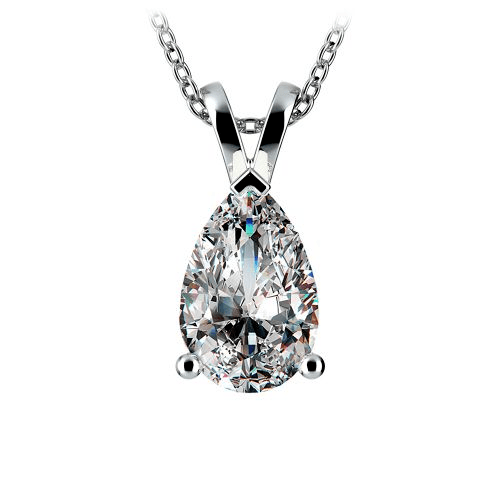 No matter how large the carat size of the pear, avoid a look of overlap between the dress neckline and the pendant. The diamond should not lie against fabric—only the skin. When choosing larger carat diamonds or pears with double halos for a larger effect, select a heavier chain to accommodate the weight of the necklace and create a balanced look. Also remember that diamonds are classic and classy. Even if the dress is heavily dazzled and full of beadwork, the right diamond necklace will still look stylish and elegant. Bold doesn’t mean gaudy. Play around with different looks and carat sizes to find the necklace that elevates your dress and your style. No matter what pear-shaped diamond necklace you choose to wear on your wedding day, the classic tear-drop design of the pear is the perfect way to take the look to the next level. Pick a pear for the perfect wedding necklace, adding bridal beauty that’s just ripe with Brilliance!